Get your jelly on with our help in King's newest puzzler! Knee-deep in jelly with Candy Crush Jelly Saga? It might be time for you to employ some tips and tricks so you can make the most out of each game. Even though most of the match-3 game is much like the rest of the games from King and the puzzlers out there, you might still be running into trouble with the new jelly mechanics. Keep these tips and tricks in mind when attacking the game from now on and see if you can become a King (or Queen) of Candy Crush Jelly Saga yourself! Striped candies are there to make sure you get the power-ups you need. You'll have to ensure you're using them at every opportunity if you want to proceed as well. Make sure when you're gathering candy matches you try and create them on squares where there's already jelly. Striped candies are especially useful here since they'll get rid of a couple lines in a row. Once you've made them, use them wisely. They could end up saving you from having to retry a level over and over. You should already be aware that you only get a set number of moves, but that means a whole lot more in Candy Crush Jelly Saga. This time around, some game boards use multiple stages. It definitely doesn't seem fair, does it? You can tell when you get into a level how many different boards you'll have to clear out, and you can watch the counter at the top of the screen to see what percentage of the level you actually have left so you don't have to sit and guess. It should go without saying, but don't spend your gold bars every single time you want to continue the game. It's not always worth it to do so, and you could be squandering quite a bit of your hard-earned cash this way. You get about fifty gold bars when you start the game, and you can use them as you see fit, but hang onto them. Don't even bother using them to buy a continue unless you're absolutely certain you can finish out a level. Most of the time it's actually better for you to start over and see what trying again does for you, even if it means spending more time doing so. 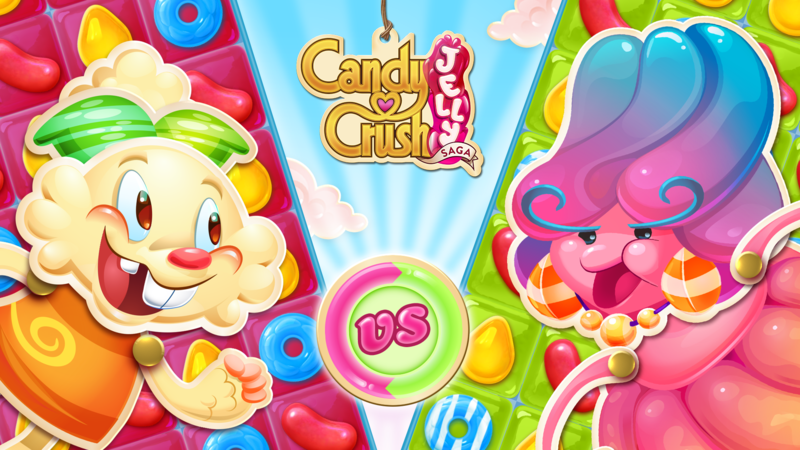 There's a new Boss mode in Candy Crush Jelly Saga that you should absolutely keep abreast of. Basically you'll be set up against another character in order to establish diminion over the level. Your move limit still applies, so you need some special moves to come out on top. Make sure you remove frosting in Puffler levels, watch the bosses for their specials, and keep an eye on what's going on.